Tahu Gejrot is a spicy tofu dish food from Cirebon, a port town in West Java, Indonesia. 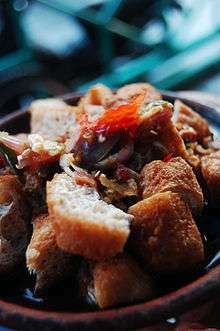 Tahu gejrot consists of tahu pong, a type of hollow tahu goreng (fried tofu) cut into small pieces. It is served with a thin and watery dressing that is made by blending palm sugar, vinegar and sweet soy sauce. It is usually served in a small earthenware bowl or layah, with ground garlic, pounded shallot and hot bird's eye chili cut into pieces to add spiciness. Wikimedia Commons has media related to Tahu gejrot.